Pretty soon this could become a screaming match: Democrats will accuse Republicans of scientific ignorance; Republicans will accuse Democrats of allowing government officials, syringes in hand, to stand menacingly between parents and their kids. It’s a debate that, touching as it does on politically primal issues of government and liberty and rights and science, offers up exceedingly juicy red meat for both sides. But it would be extremely unfortunate if this blossomed into a full-blown campaign issue. 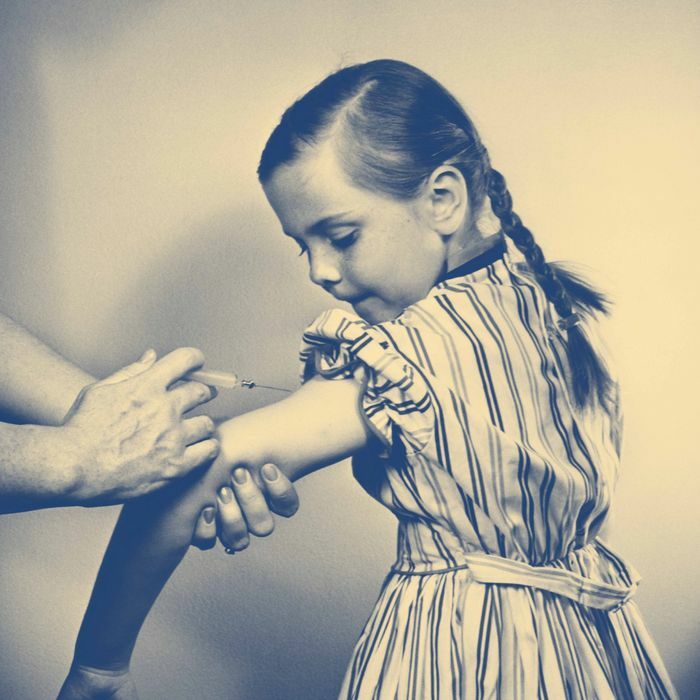 The research shows that those on the left are just as susceptible to anti-vaccine hysteria as those on the right — it is not, at the moment, an issue linked to political identity. But if the fight over vaccines becomes fully politicized, it will become linked to political identity, and there’s a great risk this could drive down vaccination rates. That doesn’t mean there aren’t easy stereotypes, of course. Perhaps the most frequently disseminated one is of a certain type of brainless, organic-food-obsessed liberal. “People have a mental model of the non-vaccinator and overgeneralize from that one stereotype they have in mind,” said Nyhan. “Rich liberals in Boulder, Colorado, Marin, California, and Santa Monica, places like that.” On the other side of the coin, liberals point at libertarians who put other kids at risk for the sake of their “liberty,” and at religious communities where an understanding of science is, to say the least, lacking. Those hoping to score points off of these stereotypes have no shortage of fodder. “There certainly are places — rich, overwhelmingly white, educated coastal enclaves — that have high exemption rates in some of their schools,” said Nyhan. But on the other hand, he pointed out, Idaho — “not a liberal coastal enclave” — has one of the highest state-level vaccination-exemption rates in the country. And the biggest outbreak contributing to 2014’s uptick in measles cases, Nyhan said, was among the Amish population in Ohio. Orthodox populations in Brooklyn have seen outbreaks as well. The fact that people with anti-vaccine beliefs are spread across the ideological spectrum is actually a good sign: As both Kahan and Nyhan pointed out, if anti-vaccination beliefs had taken hold among any one sizable group and changed that group’s vaccination behavior, we’d likely be faced with significantly lower vaccination rates — and a significantly scarier public-health problem — than what we’re seeing today. For whatever reason, American minds — conservative and liberal alike — seem relatively well-inoculated against anti-vaccine hysteria. At the moment they do, at least. The worst-case scenario, as campaign season ramps up, is that this fight becomes politicized and sweeps moderately anti-vaccine folks — those who have developed misplaced fears about the process but are likely, at the end of the day, to go ahead and inoculate their kids — into the more radical anti-vaccine camp. “If you create the association between vaccines and identities in these groups, then you will make vaccination and vaccines [into this] very political conflict that doesn’t exist now,” said Kahan. Reams of social-science research have shown that when people feel their identity is under attack, their hearts harden, in a sense — they cling tighter to their group’s beliefs. So if this isn’t going to be a political issue, how should it be addressed? The expert consensus at the moment seems to be: (1) Researchers haven’t yet figured out which messages can bring anti-vaccine folks into the fold; and (2) to the extent any messages are effective, they have to come from local, trusted figures rather than dictates issued on high from politicians or national-level health authorities like the CDC. Kahan and Nyhan echoed similar themes — and both said that the number of hard-core anti-vaccination True Believers is actually quite low. The Jenny McCarthys of the world are greatly outnumbered by those aforementioned moderates — folks who, perhaps thanks to the ease with which people can access medical quackery these days, are a bit torn on the issue, but who, if approached the right way, might be willing to embrace the overwhelming medical consensus. “The right way,” in this case, means in the quiet of a pediatrician’s office — not amidst the cacophony of a screamingly recriminatory national debate.